The Mineralogical Society of America sponsored a short course for which this was the text at Stanford University December 9 and 10, 1995, preceding the Fall Meeting of the American Geophysical Union and MSA in San Fransisco, with about 100 professionals and graduate students in attendance. A silicate melt phase is the essential component of nearly all igneous processes, with dramatic consequences for the properties of the Earth's interior. Throughout Earth history and continuing to the present day, silicate melts have acted as transport agents in the chemical and physical differentiation of the Earth into core, mantle and crust. The occurrence of such magmatic processes leads to the definition of our planet as "active," and the resulting volcanism has a profound impact on the Earth's atmosphere, hydrosphere and biosphere. Although near-surface melts are observed directly during volcanic eruptions, the properties of magmas deep within the Earth must be characterized and constrained by laboratory experiments. Many of these experiments are designed to aid in developing an atomic level understanding of the structure and dynamics of silicate melts under the P- T conditions of the Earth's crust and mantle, which will make extrapolation from the laboratory results to the behavior of natural magmas as reliable as possible. Silicate melts are also the archetypal glass-forming materials. Because of the ready availability of raw materials, and the ease with which molten silicates can be vitrified, commercial "glass" has necessarily implied a silicate composition, over most of the history of glass technology. The properties of the melt, or "slag" in metallurgical extractions, determine the nature of the glass formed, and the needs of the glass industry have provided much of the impetus for understanding the structure-property relations of molten silicates as well as for the glasses themselves. It is now recognized that any liquid might become glassy, if cooled rapidly enough, and understanding the thermodynamic and kinetic aspects of the glass transition, or passage between the liquid and glassy states of matter, has become a subject of intense interest in fundamental physics and chemistry. Glasses have also been studied in many geochemical investigations, often as substitutes for the high temperature melts, with the results being extrapolated to the liquid state. In many cases, in situ techniques for direct investigation of these refractory systems have only recently become available. Much valuable information concerning the melt structure has been gleaned from such studies. Nevertheless, there are fundamental differences between the liquid and glassy states. In liquids, the structure becomes progressively more disordered with increasing temperature, which usually gives rise to major changes in all thermodynamic properties and processes. These changes must, in general, be investigated directly by in situ studies at high temperature. Studies of glass only represent a starting point, which reflect a frozen image of the melt "structure" at the glass transition temperature. This is generally hundreds of degrees below the near-liquidus temperatures of greatest interest to petrologists. Since the early 1980s, a much deeper understanding of the structure, dynamics, and properties of molten silicates has been developed within the geochemical community, applying techniques and concepts developed within glass science, extractive metallurgy and liquid state physics. Some of these developments have far-reaching implications for igneous petrology. The purpose of this Short Course and volume is to introduce the basic concepts of melt physics and relaxation theory as applied to silicate melts, then to describe the current state of experimental and computer simulation techniques for exploring the detailed atomic structure and dynamic processes which occur at high temperature, and finally to consider the relationships between melt structure, thermodynamic properties and rheology within these liquids. These fundamental relations serve to bridge the extrapolation from often highly simplified melt compositions studied in the laboratory to the multicomponent systems found in nature. This volume focuses on the properties of simple model silicate systems, which are usually volatile-free. The behavior of natural magmas has been summarized in a previous Short Course volume (Nicholls and Russell, editors, 1990: Reviews in Mineralogy, Vol. 24), and the effect of volatiles on magmatic properties in yet another (Carroll and Holloway, editors, 1994: Vol. 30). In the chapters by Moynihan, by Webb and Dingwell, and by Richet and Bottinga, the concepts of relaxation and the glass transition are introduced, along with techniques for studying the rheology of silicate liquids, and theories for understanding the transport and relaxation behavior in terms of the structure and thermodynamic properties of the liquid. The chapter by Dingwell presents applications of relaxation-based studies of melts in the characterization of their properties. Chapters by Stebbins, by Brown, Farges and Calas, and by McMillan and Wolf present the principal techniques for studying the melt structure and atomic scale dynamics by a variety of spectroscopic and diffraction methods. Wolf and McMillan summarize our current understanding of the effects of pressure on silicate glass and melt structure. Chapters by Navrotsky and by Hess consider the thermodynamic properties and mixing relations in simple and multicomponent aluminosilicate melts, both from a fundamental structural point of view and empirical chemical models which can be conveniently extrapolated to natural systems. 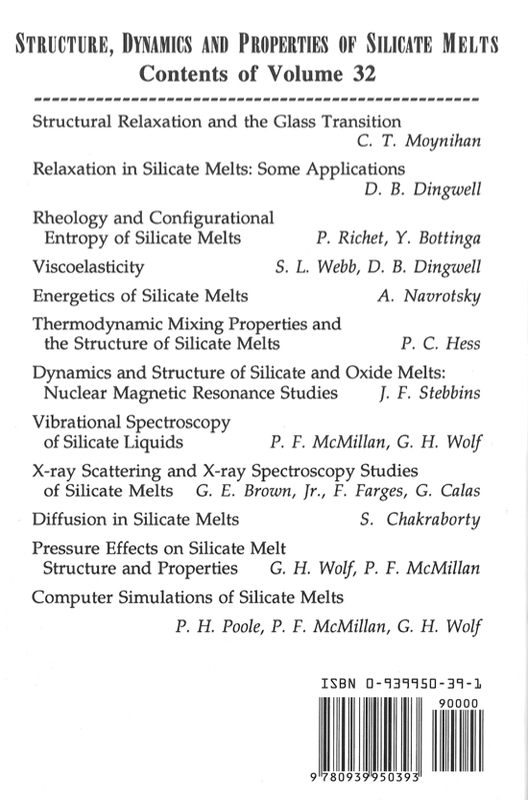 The chapter by Chakraborty describes the diffusivity of chemical species in silicate melts and glasses, and the chapter by Poole, McMillan and Wolf discusses the application of computer simulation methods to understanding the structure and dynamics of molten silicates. 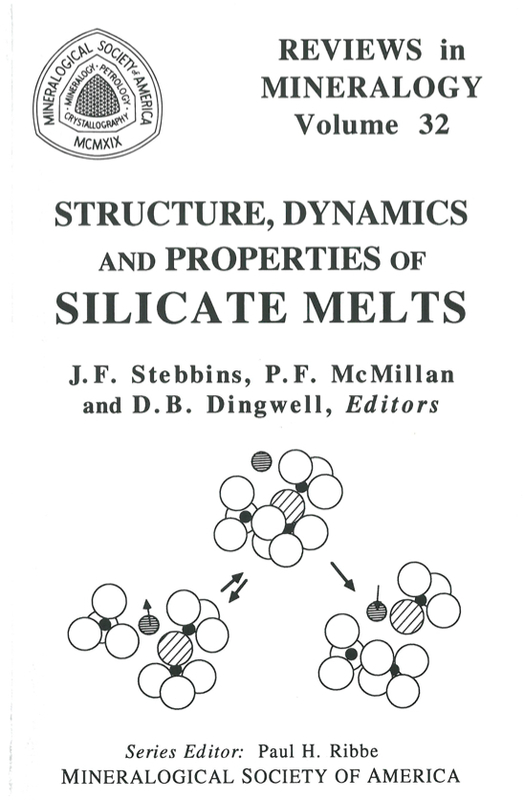 The emphasis in this volume is on reviewing the current state of knowledge of the structure, dynamics and physical properties of silicate melts, along with present capabilities for studying the molten state under conditions relevant to melting within the Earth, with the intention that these techniques and results can then be applied to understanding and modeling both the nature of silicate melts and the role of silicate melts in nature.